By integrating the experiences and know-how cultivated so far with the latest technologies and skill, SHINNIHON KOGYO CO., LTD. strives to offer factory automation systems ever more enthusiastically to customers of diverse industries, including semiconductors, flat panel displays, medical and pharmaceutical products, and food and office automation equipment. 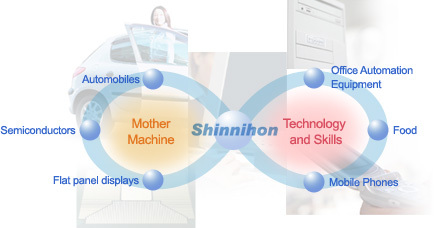 SHINNIHON KOGYO CO., LTD. has the mother machines, technologies and skills to respond flexibly to the needs of a wide range of customers. We can accommodate various types of work from ultra-precision processing to large-scale processing, by making full use of jig-boring machines and five-axis processing machines. Furthermore, designs of even higher accuracy have been achieved by incorporating three-dimensional computer-aided design. We offer services with high added value to customers from all areas of industry. In addition, there are many qualified engineers and other professionals working with SHINNIHON KOGYO CO., LTD. who have been certified by the national government and testing organizations. We will continue striving to enhance our capabilities in design, component processing, assembly and other skills, and continue taking on new challenges to create innovative factory automation systems.